For 32″-65″ flat panel displays (universal security models). The SP850 Pull-out Pivot Wall Mount combines the best features of a wall mount and a pivot arm. 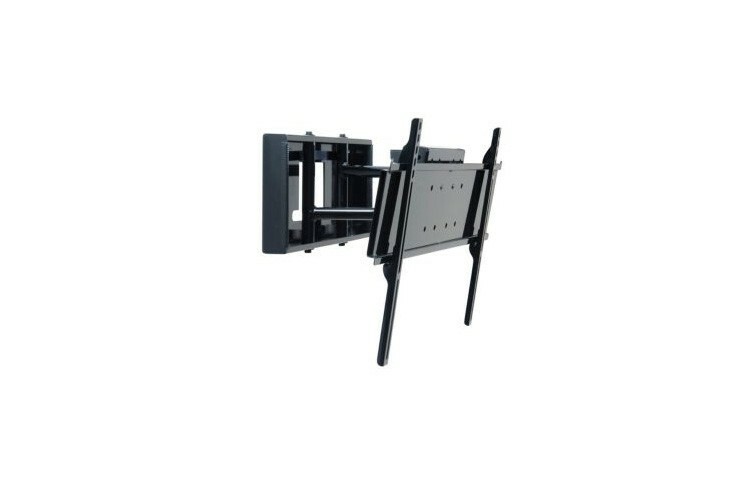 In the closed position, the SP850 acts as a flat or tilting wall mount. At only 2.31″ from the wall, its unique wall plate and built-in cable management neatly hide all components and cords. Extended, the SP850’s sturdy arm construction smoothly glides the display out 10.68″ from the wall and allows the flat panel display to pivot up to 45°. This feature not only enables the display to be positioned for an optimal viewing angle, but it also provides easy access to the back of the display for hassle-free maintenance. The SP850 is also ideal in applications where the display needs to be recessed into the wall, custom framed or aligned into a multi-display wall. Built in pivot up to 90° (45° in each direction) allows for adjustable viewing angles. Easy pull-out pivot provides quick maintenance access. Universal models adapt to displays with mounting holes up to 729 x 433mm (28.7″W x 17.05″H). 2.31″ (59mm) deep when retracted, pivot arms extend up to 10.68″ (271mm) when extended]. Clean profile design hides wiring and mount within the enclosed wall plate. IncreLok™ tilt provides tilt at 0°, 5° and 10°. ±1° of roll for horizontal display leveling during installation. Lock Key™ installation tool secures arms for display installation. Lock-out screw prevents unwanted extension. Mounts to 16″ wood studs, concrete and cinder block.